Asus pioneered the netbook in 2007 and its Eee PC range has since grown by a staggering scale. 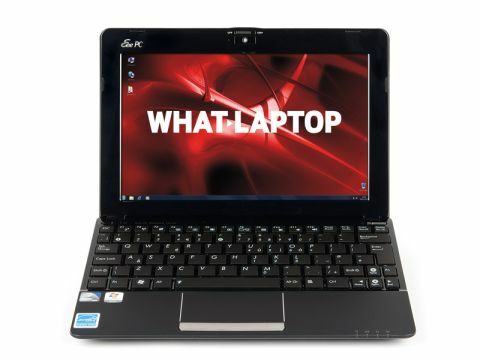 While the Eee PC Seashell 1015PE adds little to the basic netbook concept, its unique features, great usability and ample storage make it easy to recommend. The chassis looks impressively high end for such a low-priced machine, finished in sleek matt-black plastic. While the finish attracts fingerprints, it is easily cleaned. The resilient build quality is also more than tough enough for frequent travel use. Despite being one of the larger netbooks on the market, the 1.3kg chassis remains suitably slim and portable. Powered by a 6-cell battery, we were able to work for almost eight hours on the move – a great result, but slightly bettered by the Acer Aspire One D260 and Packard Bell Bell Dot S.
Asus was one of the first to use an isolation-style (or 'Chiclet') keyboard on a netbook and the feature is well implemented here. While the keys are smaller than those of the Acer Aspire One D260, the spacious design and firmly fixed board ensure comfortable typing. As with the Acer, a large touchpad is also in place. Perfectly mirroring the wide aspect ratio of the 10.1-inch screen, the wide pad makes it easy to manoeuvre onscreen. The single brushed-aluminium mouse button adds to the style of the device and is equally comfortable to use. Asus has utilised a matt TFT screen rather than a glossy Super-TFT panel. Reflections are entirely eliminated, making it easy to work outdoors. While many matt TFT screens can tend to reduce image vibrancy, we saw no such flaw here. Powered by the same components as most of its rivals, performance is basic at best and only suitable for home office use. With that said, the Asus ran ever so slightly faster than most other netbooks at this price point, although the difference will be negligible in daily use. Where this machine stands out from the crowd is in the extra features it provides. As well as a capacious 250GB hard drive, Asus also includes 500GB of online storage, letting you safely back up your data via the internet wherever you go. As with most other netbooks, a webcam is fitted above the screen. The Asus' camera is unique, however, as it includes a sliding shutter to cover the camera when not in use for greater privacy. Finally, proprietary ExpressGate software is also installed. Asus has delivered yet another fantastic machine with the Eee PC Seashell 1015PE. While we prefer the improved usability and battery life of the Acer and Packard Bell, there's no denying this is one of the best you can buy.